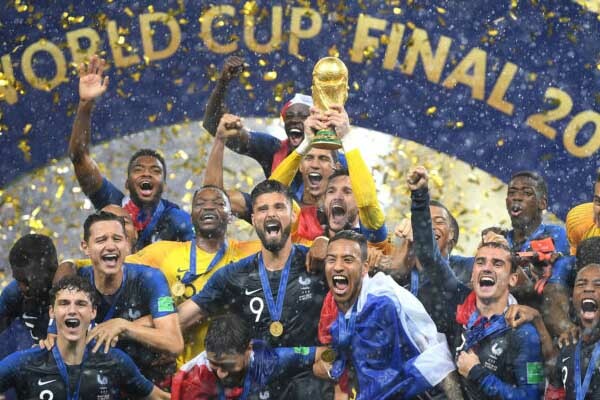 France defeated Croatia 4-2 in an exciting 2018 World Cup Final. Croatia looked like the better team throughout the game, but France was able to score effectively and end Croatia’s miracle tournament run. This marks their second World Cup victory and establishes them as the best in the world. Croatia got on the ball early and was looking quite fluid. They couldn’t get the final pass through, but their build-up play put France on their heels several times. A weak foul and questionable dive from Antoine Griezmann gave France a free kick in a good position. Croatia’s striker Mario Mandzukic rose up in trying to clear the ball but instead put it past his own keeper. This was the first own goal in World Cup Final history, which would’ve been a lucrative prop bet for anyone who made the wager. Despite France’s luck, Croatia continued to push the ball on kept knocking on the door. Their equalizing goal finally came through Ivan Perisic, arguably their greatest player of the game. Perisic took down a pass and used a clever touch to give him enough space to unleash a strong low shot with his left foot. Minutes later, Perisic found himself in the spotlight again but this time for the wrong reason. His hand was in a vulnerable position that deflected the ball away on a corner kick. The referee used VAR technology to grant France a penalty, which Griezmann easily converted. France started to come alive in the second half and put themselves up by another goal via link-up play between Griezmann and Paul Pogba. Pogba first shot was blocked but he tracked the rebound as it rolled into no man’s land and scored with his left foot. Croatia’s keeper Subasic was frozen after planting his feet the wrong way. A few minutes later, 19-year-old Kylian Mbappe had the ball and moved into a small bit of space to let out a low shot that rolled past Subasic. At 4-1, Croatia looked devastated. Mario Mandzukic made up for his early error minutes after the Mbappe goal after chasing down France’s keeper Hugo Lloris. Lloris attempted to dribble around the incoming Mandzukic, but the Croatian stuck a foot out and poked the ball into the net. Croatia got some hope with the new goal and looked ready to mount an incredible comeback. They had 20+ minutes to score 2 more goals. Croatia had multiple chances, including a clear sight on goal through substitute Marko Pjaca, but they were never able to convert. France almost scored a couple more times themselves. Pogba had an open look in front of goal and completely whiffed the cross. Perhaps the thought of winning threw them off their game. 5 minutes of extra time were added on, but it wasn’t enough for Croatia. The whistle blew and France began their celebrations. All in all, it was a fantastic game. Croatia had way more shots and possession, but it doesn’t matter if you don’t do anything with those chances. The first goal was unfortunate due to Griezmann’s dive, but the penalty and the other 2 were deserved. Kylian Mbappe won the Silver Ball award for the best young player and Croatia won the Golden Ball award for best player in the tournament. France will be a strong team for years to come since most of them are young. Croatia should also fare well in the upcoming Euro 2020.